One of the best things about studying in Europe is how easy (& relatively cheap) it is to travel to other places in Europe. It’s easy to justify a two day trip to nearby places for a hundred dollar plane ticket and a little more for an Airbnb. Lucky for me, I do not have any classes on Tuesdays this semester (I know, weird day) and I didn’t have any field studies on a particular Wednesday when my mom was visiting me, so we packed our bags on a Monday night and flew to Paris for a quick mother/daughter adventure! My parents came to visit me in my temporary home over Travel Week 2 and neither had ever been to Europe before(!!!!!) Their trips only overlapped for about a day which meant I got to show Copenhagen TWICE. 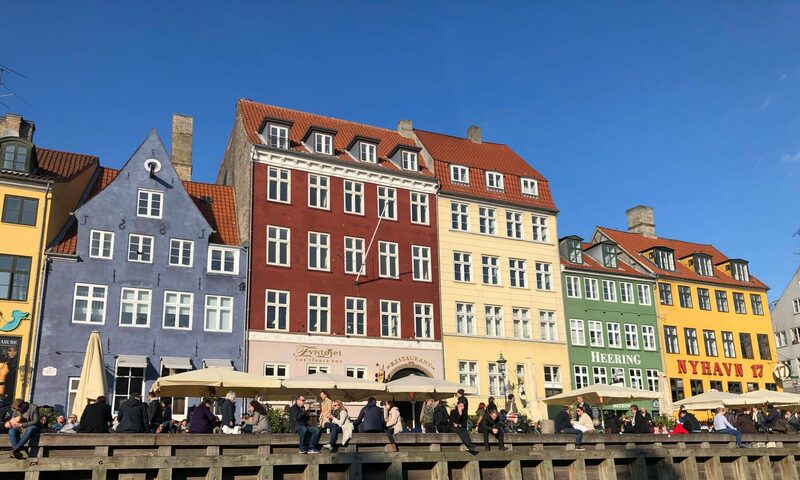 My mom and I had just finished up with a packed weekend of exploring Copenhagen and I returned to school on Monday, but after my classes ended, we finished up packing, headed to the airport, and arrived at our cute little hotel around midnight. We decided to start Tuesday off with quite a challenge: climbing Cathédrale Notre-Dame de Paris. Neither of us really knew what we were getting ourselves into, but the view from the top was definitely worth it. After we climbed back down lots and lots (and lots) of steps, we roamed around for a little before heading into a cute little restaurant to get some lunch. I tried Choucroute Garnie at the restaurant we went to! Later on we went on a canal tour on a Seine River Cruise (which is almost 500 miles long!). We got to see many of the famous landmarks in Paris including a close-up view of the Eiffel Tower. It was kind of surreal seeing it in person for the first time after hearing about it and watching it in so many other things. During the river tour and braving a few of the elements, we walked through the Tuileries Garden and then made our way up Avenue des Champs-Élysées. It started raining pretty hard on our way to the Arc de Triomphe so we made a pit-stop at an adorable café to warm up with some hot chocolate. When the rain lightened up a little bit, we continued on our way to the Arc de Triomphe and stopped in a few stores along Champs-Élysées including a HUGE Adidas store that I could’ve happily spent all my money in. After wondering in and out of stores, we finally arrived at the magnificent Arc de Triomphe. We stood across from it for a while and just watched all the cars push their way around with no particular traffic pattern. Then we walked underground to get beneath it which made us feel so small. It was so incredible to take it all in and walk all around it. Before we went up to the second landing in it, we went and got dinner at another cute restaurant. By the time we got up to the second level, the sun had set and Paris was completely lit up by all the lights. All we could do is just walk around and try to take in every detail so we could remember the amazing views for as long as possible. We went around to each side and tried to point out what we had seen that day. After extending our time up there for as long as possible, we decided it was time to head home, BUT just as we were walking out from the bottom, the Eiffel Tower started sparkling. It was the perfect way to end our first day in Paris. We only had about a half-day on Wednesday to get the rest of our must-dos done. We started our day at the beautiful Saint Chapelle which first opened in the year 1248!!! Although it suffered a lot of damage during the French Revolution, it is still decorated with some of the original stained glass. Following the Sainte Chapelle, we walked to the Louvre. Fun fact: the Louvre is the world’s LARGEST art museum. And large is an understatement for this place. The museum is so overwhelmingly big that I would highly recommend doing some research about the exhibits and layout before going. My mom and I didn’t have a plan prior to going but we still enjoyed walking around and reading about all the different types of art. Of course we went to go see the Mona Lisa (along with probably more than 200 other people). The Mona Lisa was painted by Leonardo de Vinci in 1503 and now hangs in its own room at the Louvre protected by its own bodyguards and encased in bulletproof glass. After seeing this painting in person, it made me wonder why it is so famous and although I’m still confused about all the fascination, the painting does have quite an interesting history. Our favourite part of the museum was exploring the moat that surrounds ‘The fortress of King Philippe Auguste’ (AKA The Louvre). He ordered a wall to be built around to protect Paris against the threat of invaders from England. The entire fortress was surrounded by a moat (which we were standing in) and fed by the waters of the Seine River. That is a very brief and not all encompassing history of where we were standing, but nonetheless, amazing. After the Louvre, we found an adorable Italian restaurant where we enjoyed a salad and pizza before heading back to the Cathédrale Notre-Dame de Paris to see the inside. As our last stop, it did not disappoint. From the size of the cathedral to the stunning stained glass to all the little architectural details, it was absolutely breathtaking. To add to that, getting through security at the Paris airport was crazy, but we made it home safe and I got my mom to the Copenhagen airport on Thursday morning. All in all, a very memorable time spent with my mom (and dad) that I will forever cherish. This is awesome!! Glad your parents got to come visit. I love reading your adventures!! I’m glad they got to come too!! Thank you! !